Our NK8 software converts the Nokia N800 or N810 wireless touch panel into a controller for your entire home’s lighting, thermostats, security system, webcams, and electricity meter. The NK8 communicates over the internet, or over your home’s wifi network, to an ISY-series home automation controller from Universal-Devices. - Customizable. Our interface allows you to create your own hierarchy of folders & controls. You create the layout and choose which buttons you want where. Create a custom layout to match the touch panel’s location, or your personal preference! - Thumb-friendly. 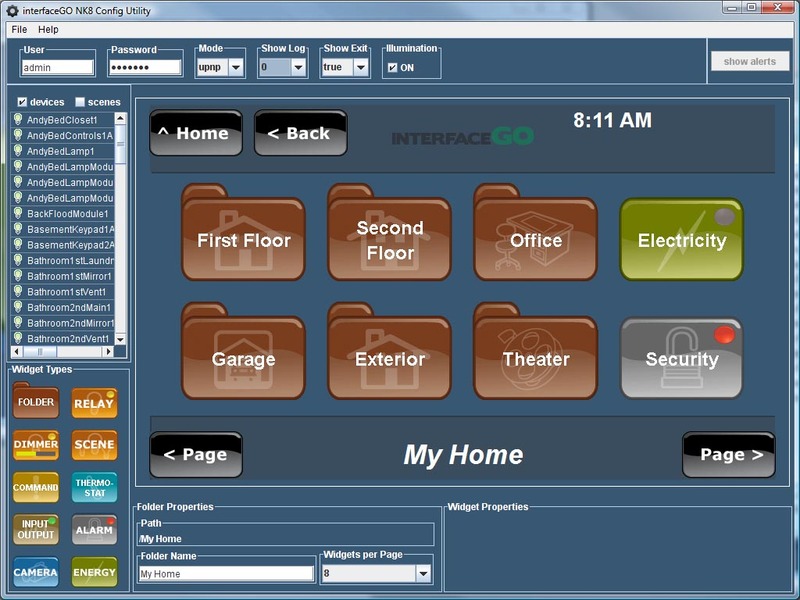 Our GUI is designed for easy control without a pen. On-screen buttons are large, easy to press, and easy to read. - Wireless. Wifi connectivity lets the touch panel move around the home. One touch panel can serve multiple locations. The small and extremely light Nokia tablets can be carried easily from room to room! - Attractive. The Nokia’s gray/silver front gives it a classy yet modern look. Our colorful and clean interface paired with the Nokia’s 4.1″ high resolution screen is a good-looking combination. - Versatile. 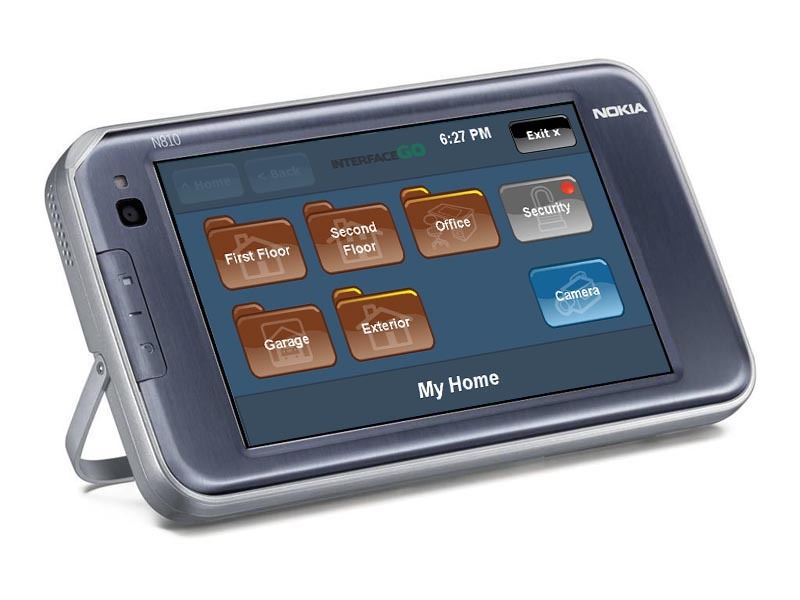 Our touch panel software runs on the powerful Nokia N800 and N810. Simply exit out of the NK8 home control software and you can browse the web, check your email, watch videos, listen to music, communicate on Skype, use the built-in webcam, etc. Or, if you prefer, leave the Nokia running as a full-time home-control touchscreen! How configurable is the interfaceGO NK8′s interface? Very. We’ve designed the GUI to allow full control over the folder/button hierarchy to suit the end-user’s preference and primary touchscreen location. The user can configure the interface to show an exit button in the upper-right hand corner of the touchscreen, or instead use a tiny hidden exit button. Screenshots above are with the hidden exit button. Is the interfaceGO NK8 limited to 8 buttons per folder? Does the NK8 display the status of my home in real-time? Yes. 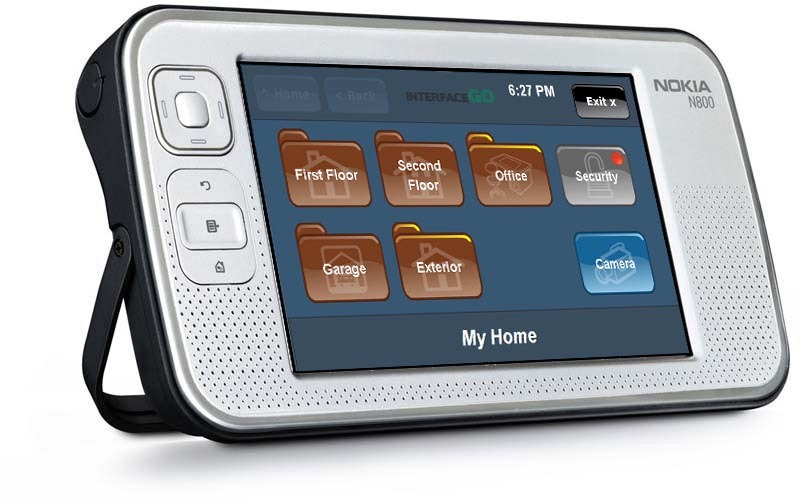 The interfaceGO NK8 communicates with the ISY in real-time – no manual screen refreshing is needed. If the ISY knows that a light, thermostat, or security system status has changed, the NK8 knows and will update it’s GUI immediately. What are the specs on the Nokia N800/N810? The Nokia N800/N810 includes a high-resolution (800×480) 4.1″ touchscreen and 802.11g wifi capabilities. Other specs are available on Nokia’s web site. What is the expected battery life of the Nokia? Are there any advantages to buying the Nokia N810 over the N800? There is no advantage to using the N810 over the N800 with our NK8 software. The N810 includes a sliding backlit keyboard and a few other nice features – but, for dedicated NK8 software use, the N800 is just as good. Can I still use the Nokia N800/N810 for other tasks? Sure. The user can exit out of the NK8 software and use the Nokia to browse the web, play media files, run other applications, etc. Can I have multiple N800/N810s running the NK8 software in my home? Can I control my home with the NK8 software through the internet? Yes, the N800/N810 can be configured with the NK8 software to control your home from any wifi internet connection – as long as your router and ISY are configured to allow external access. The NK8 currently supports HTTP access only – it does not support HTTPS. Since the NK8 is in constant communication with the ISY, a reliable internet connection is required. Please keep in mind that an HTTP connection is not encrypted, so use this connection method at your own risk. How many touch panels can I install the NK8 software on? The NK8 software is licensed to be installed on a single Nokia N800/N810 touch panel. Additional touch panels require additional licenses. The Config Utility can be installed on as many PCs as you’d like. When will the interfaceGO NK8 be available? The NK8 is now shipping. How much does the interfaceGO NK8 cost?